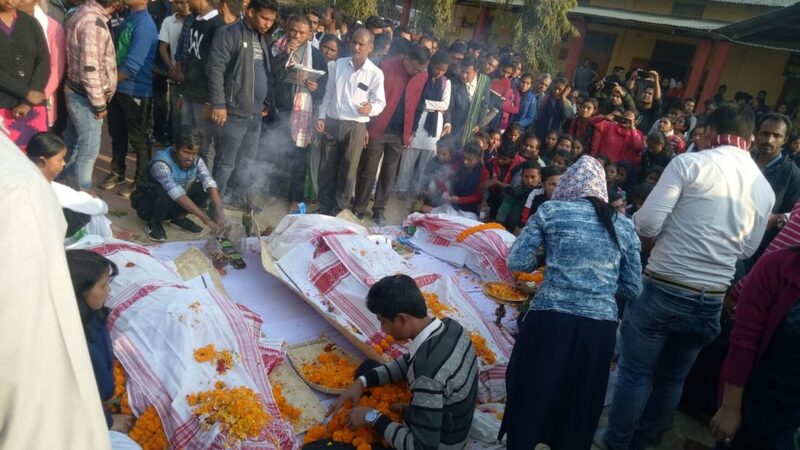 CKB College, a higher education institute at Teok in Jorhat district, which lost three of its teachers in an accident on Wednesday night, witnessed heart-rending scenes on Thursday afternoon when the bodies were brought to the College before being taken for last rites. Hundreds of students, former students, teachers, staff and others including Mariani MLA Rupjyoti Kurmi of the Congress and Pallavi Gogoi Saikia, daughter in law of former Teok MLA, Membar Gogoi, also of the Congress congregated in the College to pay their last respects. Several students and former students and teachers broke down when the bodies were laid in the grounds of the College. Principal of the College BK Pachoni delivered a speech briefly mentioning the contributions of the teachers and the great loss that the College had suffered. A student of the College said that all the teachers had taken special care while teaching the students and would be missed. Two teachers of had died on the spot late on Wednesday night and a third succumbed to his injuries at Jorhat Medical College and Hospital here today in a tanker – car collision near Kakodonga bridge on NH 37 under Dergaon police station in Golaghat district. Another teacher Narendra Nath Saikia (58) who is said to be critical has been referred to GNRC today from Baruah Surgical here. All four were returning by Scorpio from the Youth Festival organized by Dibrugarh University at Sarupathar College, Golaghat district. The driver of the tanker (AS B 0573) is absconding. .
Ranjit Ranjan Saikia (57), associate professor of history, who owned the car (AS 03 M 8175), was driving it when the accident took place with the tanker which was headed towards Guwahati. The other teacher who died on the spot was Keshab Hazarika (48), assistant professor of political science. He hailed from Doomdooma Hahnsora. Jintumoni Phukan (39) assistant professor of political science died at JMCH at about 3 am today. Narendra Nath Saikia (58), associate professor of economics, was first referred from JMCH to Baruah Surgical and then to GNRC. A pall of gloom has descended on Teok area.